When I began working here 25 years ago, I could not appreciate the perspective I would get from working in EPA’s Superfund program from its early years, seeing it grow and evolve. In December 1980, Congress enacted the Comprehensive Environmental Response, Compensation, and Liability Act (CERCLA), more commonly referred to as Superfund. As we celebrate the 35th anniversary of the Superfund program, I look forward to my 25th anniversary with EPA Region 7 here in the Heartland. 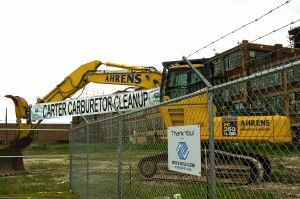 Superfund sites fall into two general categories: removal sites and remedial sites. Removal sites generally require short-term action. These are train car derailments, abandoned drums along a back road, or spills that may require quickly providing people with an alternative supply of clean water. The other category of Superfund sites, called remedial sites, require long-term actions to address contamination that may be more widespread or complex. Most of my work has involved remedial sites. Little did I realize when I first started at EPA that I would be working on the first site assigned to me 25 years later – and someone will still be working on it when I retire! Does this mean I’ve failed? No, and let me explain why. Many Superfund sites are the result of the way hazardous materials were disposed of in the 1800s through the 1960s. Wastes from many manufacturing operations were buried underground, poured down wells, piped to waterways, or just left behind when businesses ceased operations. This was not unlawful at the time, and was probably perceived by most people as perfectly acceptable. They did not realize that, decades later, the soil where they live or the groundwater they rely on as a source of drinking water would be contaminated and unsafe to use. There are still new Superfund remedial sites being identified in Region 7, but a significant amount of the work we do involves making sure that sites where cleanup activities were initiated many years ago, continue to make progress toward their cleanup goals, remaining safe in the meantime. This is part of the Superfund program evolution. We are also actively involved in the redevelopment of some of these remedial sites. Even though a significant amount of contamination remains in the subsurface at one of my sites, because there is not currently a technology available to remove it, we are working with the local government on their plans to put their municipal bus storage facility on the property. There are some special issues that have to be addressed up front to make this feasible, but it’s an excellent opportunity to breathe new life into property identified as a Superfund site. It is my hope that this is the future of Superfund – new opportunities where old problems once existed. So, back to the first Superfund site assigned to me. The contamination was left at the site in the early 1900s. It was discovered in the early 1980s when the city excavated to install a new sewer line. Twenty years ago, all of the contaminated soil that could possibly be excavated was removed and treated, and the hole was backfilled under the direction and oversight of EPA. The groundwater immediately below where the contaminated soil had been is still contaminated at levels not safe to drink. But, through on-going sampling, we know exactly where the contamination remains. This means I will probably be watching over my first Superfund site until I retire, making certain it remains safe. And it is very likely someone else will be watching over it after I retire. About the Author: Diana Engeman has been a project manager in the Superfund program in Region 7 for 25 years. She has enjoyed the opportunity to work with a wide variety of people, both scientists and non-scientists, throughout her career at EPA.